← More about the Bridge Trust. Floods – policy versus practicality. 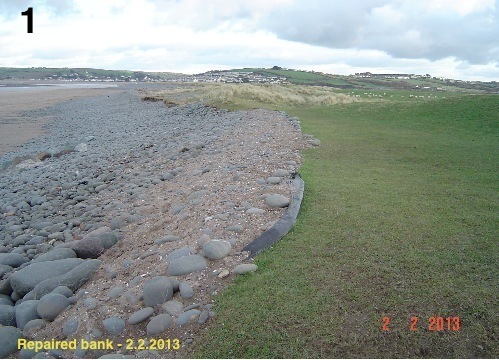 With flooding very much in the news last month this may be a good time to review the policy of the authorities on flood protection and the effect it is having on the vulnerable Northam Burrows. There are two major factors contributing to flood damage from the sea ; these are wave action caused by Atlantic storms and high tides augmented by low pressure weather systems. Last year until December was a quiet one for tide and wave erosion as there were no exceptionally high tides and generally the storms we had did not happen to coincide with the highest of them, so damage to the pebble ridge and sand dunes was comparatively minor. Even so, there were press reports of erosion of the dunes fronting Northam Burrows and some exposure of buried waste materials in the vicinity of the closed municipal rubbish dump. 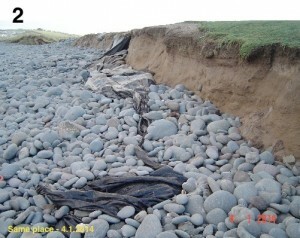 Temporary repairs carried out on the tip the previous winter had consisted of spreading a geotextile membrane over the eroded edge and covering it with sand and stones to stabilise it. The first photograph was taken in February 2013 showing a strip of the repaired bank, and this survived through the year until the December storm, when parts of the covering material were washed away. 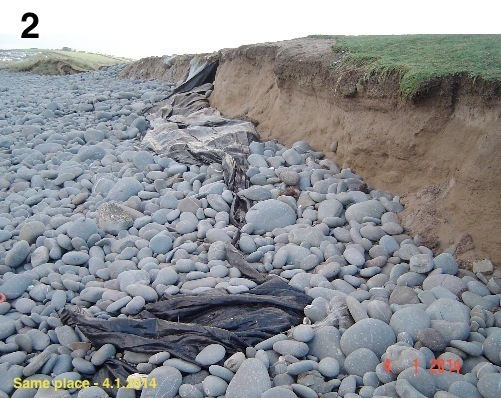 The second photo was taken on January 4th 2014 just after the biggest storm, which combined with a 6.8 metre tide to carry breakers over the rock armour and wash away most of the temporary works, leaving swathes of black geotextile membrane blowing in the wind. National policy is to leave the fate of most of the Burrows to natural forces, allowing sand dunes to wash away and reform in altered locations as they have for many centuries. Unfortunately that does not make allowance for the man-made developments we have allowed to take place on this basically unstable strip of sand, and so policy has had to be adjusted to provide artificial protection for our vulnerable assets; the degree of protection depending on current estimates of the importance, or financial value, of those assets. The three chief areas of concern are the activity and entertainment centres at the south end of the pebble ridge, the hazardous waste tip at the northern end of the Burrows, and the Golf Course in between – and at once we find problems in determining who bears the responsibility for protecting these assets from the sea, let alone how to achieve that protection. 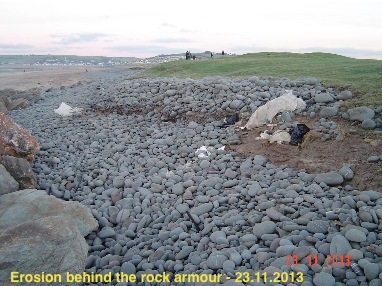 A study was carried out last year on how to protect the waste tip, at least for a few years, and a proposal is to bring in a lot of rock armour, similar to that already deployed for many years part way around, and back it up with scientifically graded pebbles like the pebble ridge itself. That just needs the approval of the appropriate authorities for the expenditure. There is always the possibility that the sea may break through permanently across the far end of the golf course and leave the tip as an island, but that is further into the future and will have to be tackled if or when it becomes imminent. The dunes that once separated the 8th Tee from the sea have already gone, (third photograph) but a considerable expanse of large pebbles has accumulated there, suggesting a (faint?) possibility that it may naturally develop into a further extension of the true pebble ridge, although that may be just for optimists ! There is a lot of work to be done on Northam Burrows in the coming year, and a lot of decision making for whoever is prepared to take responsibility. Meanwhile, there are a couple of spring tides forecast for the first week of March that will equal the highest of this winter, so let’s hope they don’t coincide with Atlantic storms this time. After that there’s a break until 10th September when, at 7:40pm., 6.9 metres is forecast which is higher than any since 2010 – could be a nice evening for a walk on the Burrows. (For an article on “Floods & Saltmarshes” from last year’s Buzz, link here). This entry was posted in Environment and tagged Atlantic storms, coastal erosion, extreme events, flood defences, flooding, Northam burrows, tidal surge, tides, Westward Ho!. Bookmark the permalink.